I’ve searched for the best dolls pram for 2 year old children. 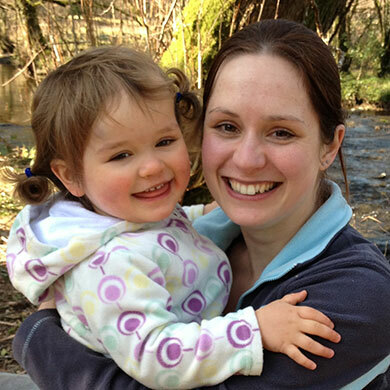 Here’s my selection for you to choose from, helping you to find the best toys for 2 year olds. The Little Love 3-in-1 Pushchair is a great pram for 2 year old children, but it’s also much more than that. Recommended for children aged 2-3 years, it provides 3 ways for a 2 year old to play and learn with their dolls. 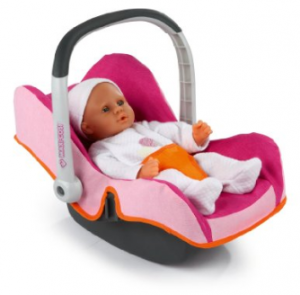 The toy cleverly transforms from a pushchair into a highchair or cot. If that wasn’t enough, it plays fun rhyming sounds, food facts and baby care reminders to encourage the 2 year old in their role play. The Little Love 3-in-1 Pushchair is designed to work with the VTech Little Love Baby Talk doll, but you can use it with other baby dolls up to 36cm tall – you’re not forced to buy a doll to go with the pram. This dolls pram for 2 year olds has an average rating of 4.9 out of 5 stars on Amazon. This shows that it’s exceptionally popular with children and parents alike. Those are all reasons why I think this is one of the best dolls prams for 2 year old children. The Peppa Pig Push Along Pram is one of the most popular, and definitely one of the best dolls prams for 2 year old children. 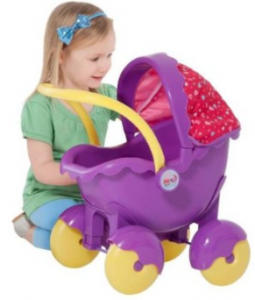 This purple pram is one of the less hideous Peppa Pig toys for 2 year olds and is suitable for 18+ months. It comes complete with matching bedding and has an adjustable handle. 2 year olds will enjoy pushing the hood up and down. This dolls pram is described as being ‘2 in 1’ because the pram body can be easily detached to be used as a separate carry cot for a doll. The Peppa Pig pram fits a range of dolls up to 40cm tall. It’s reasonably priced too, which is why I think it’s one of the best dolls prams for 2 year olds. The Baby Annabel 2 in 1 Travel System is a well made dolls pram for 2 year olds. It’s a 3-wheel stroller for your 2 year old’s baby dolls and has chunky pink foam handles, a rain/sun canopy, a storage basket (unusual for a dolls pram) and safety harness for the doll. The seat can be detached, allowing your 2 year old to carry the doll in it separately using the handle. It can also be folded up and stored away neatly. This dolls pram is designed to fit Baby Annabell dolls (of course!) but fits a wide range of dolls. Please note that the My First Baby Annabell is designed for 2 year olds whereas the bigger Baby Annabell dolls are for children aged 3 years old and above. Aimed at slightly older children (2 years old to 8 years), this dolls pram toy is less aimed at toddlers and will grow with your child. It certainly looks a lot more grown up than some dolls prams for 2 year olds and I think it’s one of the best dolls prams for a 2 year old. However it is quite expensive and is most suitable for someone buying a special birthday or Christmas gift for a 2 year old, rather than a day-to-day purchase. The Simba Smoby Maxicosi Baby Car Seat is not quite a dolls pram, but serves the same purpose. I think that 2 year old boys and girls will love putting their dolls in and out of this toy car seat just as much as a pram or pushchair. Despite being largely pink, the fact that this toy is a car seat rather than a dolls pram or pushchair feels slightly more unisex than most and will appeal to boys and girls alike. Personally I think that dolls prams are suitable for 2 year old boys or girls anyway (and I hate the pink-blue divide), but if you’re looking for something less girly then the Simba Smoby Maxicosi Baby Car Seat is a good dolls pram toy for 2 year old children. The Viga Wooden Dolls Pram is ideal for parents who favour wooden toys over plastic. 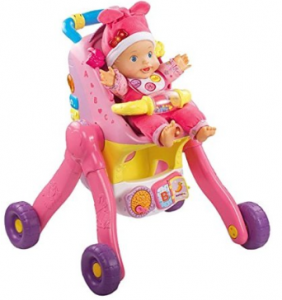 Designed for children aged 18 months and over, it’s a good dolls pram for 2 year olds. 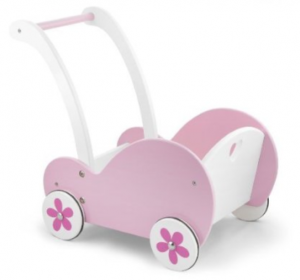 Made from wood, the dolls pram is a lovely pink and white colour with heart designs. It can fit various dolls up to 18 inches tall. This dolls pram gets the parents seal of approval with 4.8 our of 5 stars on Amazon. It’s very good value, too. If you’re looking for value then this could easily be the best dolls pram for 2 year old children. 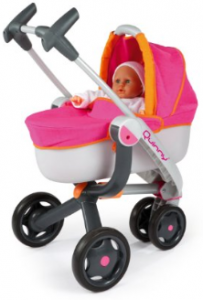 The Simba Smoby Maxicosi 3 Wheel Pushchair is a Quinny branded dolls pram, and you can tell from the quality. It’s fully foldable and is a twin dolls pushchair so it can seat two dolls. 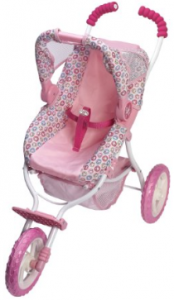 The dolls pram is easy to assemble and very durable, with rubber coated wheels. 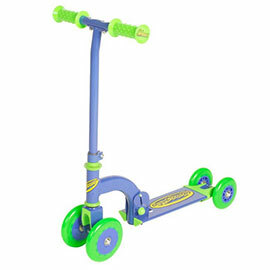 The handles are ergonomic and easy for 2 year olds to grip. 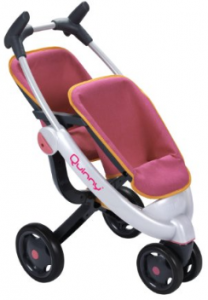 This dolls pram is especially good for 2 year olds who have their own Quinny pushchair as they will enjoy the fact that it’s the same as the one that Mummy pushes. However 2 year olds will enjoy it regardless of which buggy they have. As with the MaxiCosi dolls car seat shown above, this dolls pram isn’t quite as pink as some of them – it’s more of a mauve colour. I wouldn’t say that it’s the very best dolls pram for 2 year old children, but that’s only because the Sima Smoby Maxicosi3 Wheel Pushchair and Pram is even better (see below). This is still a good choice if your 2 year old won’t mind having the pushchair but not the pram for their dolls. The Simba Smoby Maxicosi3 Wheel Pushchair and Pram is, in my opinion, the best dolls pram for 2 year old children. The reason it gets my vote is partly because of the quality and stylishness, and partly because it converts from a pushchair into a pram and can grow with your 2 year old. This dolls pram is fully foldable and easy to store away. It has ergonomic easy grip handles, a removable seat for the pushchair and rubber coated wheels suitable for indoor or outdoor use. 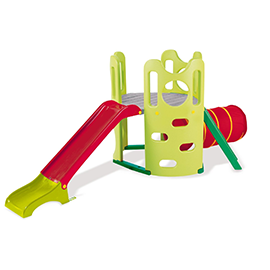 It’s easy to assemble and strong and durable, so it will last your child from the recommended age of 6 months up to 3 years or older. 2 year olds will enjoy putting their baby dolls in the pram and pretending to by their Mummy. Since most 2 year olds still use a pushchair, they will also enjoy using the pram as a pushchair as they can associate with this. It will fit most of their dolls and although this dolls pram isn’t the cheapest available, it’s not the most expensive either. Why are dolls prams one of the best toys for 2 year olds? 2 year old girls and boys are starting to learn about pretend play and starting to experiment with dolls. A dolls pram for 2 year old children is a great bet – 2 year olds are familiar with the concept of prams and pushchairs from using one themselves, and a dolls pram is the perfect way for them to start using their imagination. A lot of pretend play toys require quite advanced dexterity skills, whereas a dolls pram is best for 2 year olds because it’s easy to put a doll in and out of a pram and push it around. A 2 year old can enjoy a dolls pram without getting frustrated at all the fiddly parts that they can’t get their fingers to work. At the same time, dolls prams do encourage 2 year olds to improve their hand-eye co-ordination due to the optional features such as strapping the doll in. If the 2 year old can’t do this yet then they can simply sit the doll in the pram, or if they’re ready then they can spend hours learning how the straps and other moving parts work. 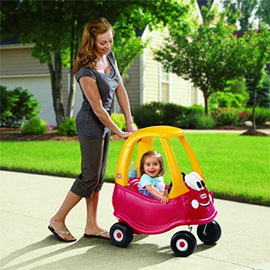 Dolls prams for 2 year olds are also a great toy because they double as a walker for your child. 2 year olds are generally mobile but may still be a little unsteady on their feet. They’re too old for baby walkers but will often enjoy the added stability from holding the pram handles as they push their doll around. However it’s not easy to choose the best dolls pram for 2 year old girls and boys and I hope this list of my favourite helps you to find the right one for your 2 year old.